Notary signing agents now have two ways to show potential clients that they have completed the NNA’s NSA Continuing Education Course: through their SigningAgent.com profiles or with a downloadable transcript. As the mortgage industry implements the Consumer Financial Protection Bureau’s Closing Disclosure rule this month, a number of title and settlement services companies have been asking NSAs to provide verification that they have completed the course. The course helps you understand how to handle the Closing Disclosure, which should start appearing in loan packages toward the end of October or early November. Every NSA who finishes the course will have their SigningAgent.com profile automatically updated with the date of completion. The update will occur within 72 hours. In addition, signing agents who completed the course from September 25 onwards will have a link to their transcript PDFs automatically emailed to them. NSAs who completed the course before September 25 can obtain their transcript by contacting the NNA’s Customer Care at 1-800-876-6827 or at services@nationalnotary.org. You will need to provide your customer ID number and the date you completed the course. Remember, the transcript shows that you have completed only the continuing education course. 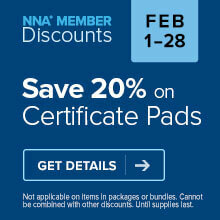 NSA Certification is a separate process and has a separate proof of completion. Hello. 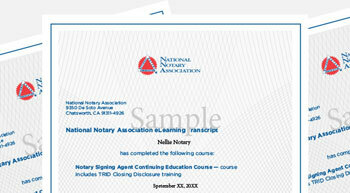 You can find more information at http://www.nationalnotary.org/support/signing-agents/signing-agents.